Take A San Franciscan Bay Cruise Today! Come aboard the lovely “Royal Prince”, Red and White Fleet’s premier bay tour boat! See the sights of the San Francisco Bay, including Alcatraz, the Bay Bridge, the San Francisco Skyline, the Marin Headlands, and the world famous Golden Gate Bridge. Did you know that Wednesdays in winter are the perfect time to come aboard? And all kids under 5 sail for free! As the locals know, winter is far warmer than the average summer day in S.F. Additionally, the usually hellish Fisherman’s Wharf on a day in early March plays host to 75% less tourists, 50% less Peruvian pan pipes, 45% less drummers playing cardboard boxes and upended utility buckets, and 10% less junkies! 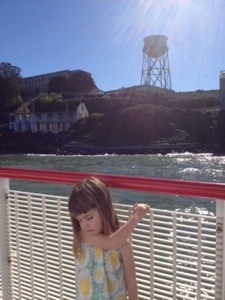 2 Responses to Take A San Franciscan Bay Cruise Today!